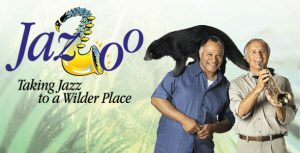 This summer, the Jazz Arts Group will take jazz to a wilder place as the Columbus Jazz Orchestra takes center stage at the Columbus Zoo and Aquarium for the sixth season of JazZoo! The four-concert series returns to the Water’s Edge Events Park at the Columbus Zoo providing a beautiful waterfront setting along the O’Shaughnessy Reservoir. Gates open at 6:30 PM with concerts beginning at 8 PM. McGuire as they perform popular American hits with a jazz and blues flair. discount for men and women serving in the military! of the CJO. You won’t want to miss the glitz and glam of this unique event! vocals to this rockin’ set. options are available through Made from Scratch.